Zebpay is a popular app-enabled bitcoin wallet service provider having its headquarters in Singapore. It also has its IT office in Ahmedabad, Gujarat. This brand was the brainchild of Mahin Gupta back in 2012 which then hadthe name of Buysellbitcoin and is known as the country’s first bitcoin exchange. Much later the company was branded as Zebpay back in September 2014 and had added two partners, namely Sandeep Goenka and Saurabh Agarwal. 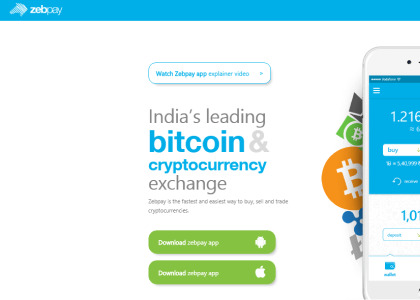 Zebpay happens to be the very first bitcoin company in India that has launched an easy to use mobile Bitcoin wallet app that allows the bitcoin transactions making use of mobile number without any issues to understand the bitcoin addresses and also taking backups or have the fear to losing the bitcoins. Making use of the Zebpay wallet app, the users have the chance to sell, buy, store as well as spend the bitcoin making use of the mobile number along with a 4 digit pin. And to make it easy for the customers today there are attractive Zebpay coupons available online at HappySale. Get to know more about Bitcoins, Zebpay gives you the best Information about bitcoins. You can buy and sell Bitcoins easily through Zebpay app. Follow the landing page to know more about Bitcoins. No coupon code required to get this information. Hurry! Zebpay offers Rs 100 worth Bitcoins free, In order to grab this deal you need to do refer your friends & family members and you can earn Rs 100 worth Bitcoins free. No need to use any Zebpay promo code. Hurry! Refer now!! Download the app to buy or sell Bitcoins in India. No Zebpay offer code or promo code required to get this deal. Check the landing page to know more about Bitcoins.